As temperatures drop, outdoor critters may find themselves looking for shelter — as well as free food. 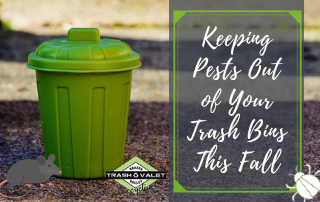 If you walk outside in the morning and find your trash bins tipped over, trash spilled out across the carport, there’s a good chance your trash bins have a pest problem. You may have even opened the trash bin one night to find an uninvited guest there. Raccoons are the biggest offenders, but opossums and rats could also be an issue. Fortunately, there are steps you can take to keep these critters out of your trash. Raccoons and the like are attracted to your trash bags by the smell of food. Your food scraps and expired leftovers smell like an all-you-can-eat buffet to them. That’s why it’s so important to keep your trash in bags and keep those bags tightly tied. You should also make sure not to overfill your trash bins, causing a bulge in the lid. This bulge essentially opens the door to small critters who want to check out your trash bins. Of course, there’s no substitute for simply keeping the lid securely closed. Make sure you pull the lid down as tightly as possible — here again, it’s important to make sure you’re not overfilling your trash bins. There are locks that you can purchase for your trash bins, but it can be tedious to have to unlock the trash bin whenever you take out the trash. If your goal is simply to keep out critters, you can use a heavy rock or something with equal weight to weigh down the lid. Bungee cords are another viable option. With bungee cords, even if the trash bin is tipped over, the contents will stay inside. You might also consider repelling pests altogether. You can create a spray with bleach or ammonia diluted with water. Whenever you take the trash out, spray the trash bin with this solution. Opossums and raccoons hate the smell of it and they’ll likely stay away. The downside is that people also usually hate the smell of it, but in fresh air, and diluted with water, it should be livable for humans, at least. Remember that pests are coming for your trash bins because they smell food. The less food waste you trash, the less interested they’ll be in your bins. Make sure to wash out all food containers before tossing them, and try to save as many leftovers as possible, rather than tossing excess food. If you have food scraps that can’t serve as leftovers, you can use them as compost. Whatever you can do to keep that food smell out of your trash bins. Keeping pests out of your trash bin is important, but it’s also important to have the right waste management company in the first place. With Brazos Valley Trash Valet & Recycling, you can get weekly curbside pick-up with complimentary recycling for just one low monthly subscription of $21.95. Contact us today to get started.